I have not yet missed a day in the 1 Year of Stitches project. There have been days when I literally added exactly one stitch, which is the beauty of this project. It is just so manageable. I have no idea of where this is going. I'm sure there will be more buttons and beads, but that's about all I know at the moment. I am usually very controlled about my creativity, so working on daily whims is both scary and joyful. I certainly think it's a a good creativity exercise. I'll be heading to the Sun Valley Fibers January Thaw later. Looking forward to meeting up with old friends and making new ones! 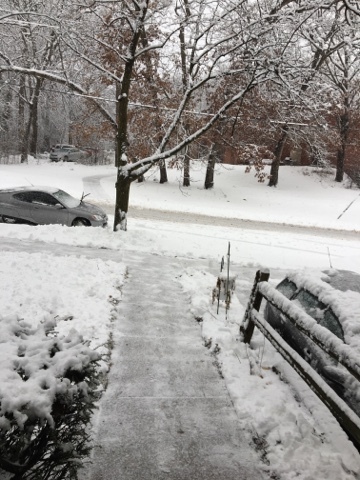 My phone rang at 6:10 this morning -- usually not a good thing. I always think something happened to my parents. But this was a robo-call from the school district informing me that the schools are closed! I would have gone back to sleep except a very hungry cat was licking my face. And I need to prepare for the Sun Valley January Thaw, which is coming up tomorrow night! 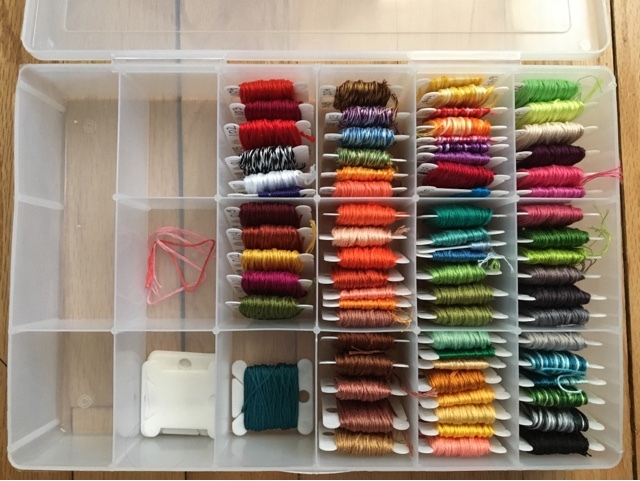 What is more fun than packing knitting? Not much! 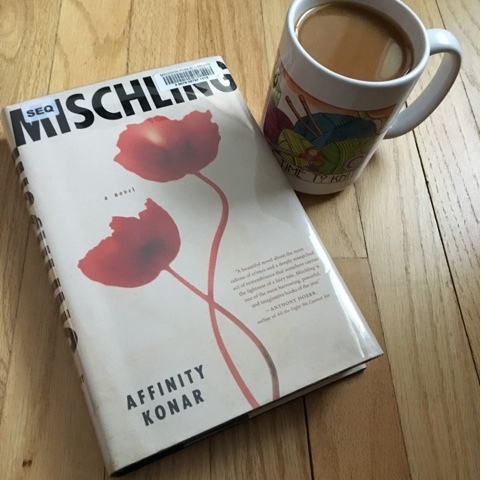 I'm having trouble finding a book that will hold my attention, so I'm taking a chance on Mischling by Affinity Konar. I don't usually read Holocaust fiction because I often feel that the quality of the fiction doesn't live up to the seriousness of the topic. This has gotten very good reviews and was on the new-books shelf at the library. It's about twin girls (fictional) who are plucked out of the masses at Auschwitz to be "treated" by Dr. Mengele. It might be too painful to read, but I'll give it a try. 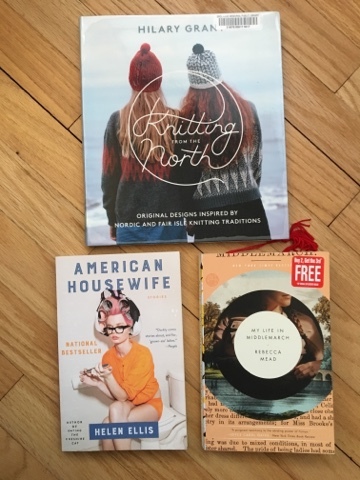 On this snowy day, I'll be linking up with Ginny to Yarn Along. I'm not sure if I've mentioned this, but I was a newspaper reporter and editor for more than 20 years, so I'm generally pretty good with deadlines. 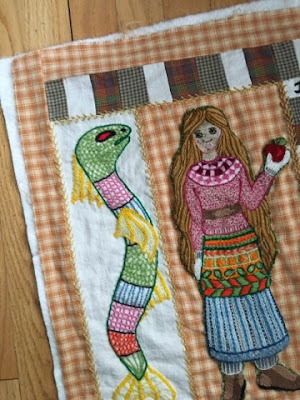 But this one really got away from me: I have to finish this quilt by Tuesday evening. I have a meeting tonight, so I don't exactly have a lot time. Thus, I spent every free minute this weekend quilting -- and I'm working before and after school, too. I will get it done -- but only because I have to! Finals week has been more exhausting than I expected, so I am quite happy that today is Friday. My brother is visiting from Virginia this weekend and my son is meeting us for dinner Saturday, so it promises to be a good weekend. I indulged myself with a cast-on this week: the Wave Fingerless Mittens. They don't look like much yet. And excuse the awful flash photo! It's dark when I leave for work and when I come home. But not for long! I just love the peaceful rhythm of this pattern. My reading is technology based this week. I'm reading News from the World by Paulette Jiles. It started out really well, but in the middle has turned into an old Western with lots of gunfights. Not sure if I'm going to finish this. The writing is beautiful and the characters are incredibly realistic. I'm listening to The Invisible Bridge by Rick Perlstein on Audible. It's about the fall of President Richard Nixon and the rise of Ronald Reagan. This book is about 36 hours of listening, so it's going to take a while to listen to the entire thing! The best thing I can say about MLK Jr. Day for me is that I didn't have to take a sick day. The stomach bug hit -- and I cannot tolerate the stomach bug. So I crafted to keep my mind off the malady. 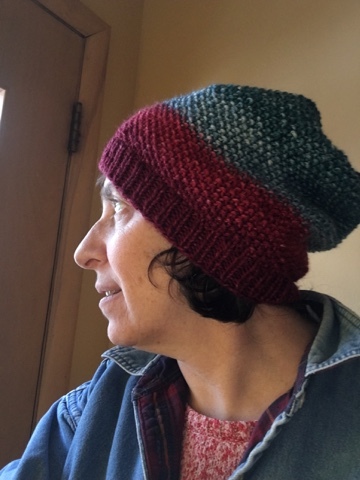 I finished the Toboggan Run hat. The yarn from Knit Circus (in the colorway Birds of a Feather) really makes the hat. This will have to be a gift as it is way too big for me. 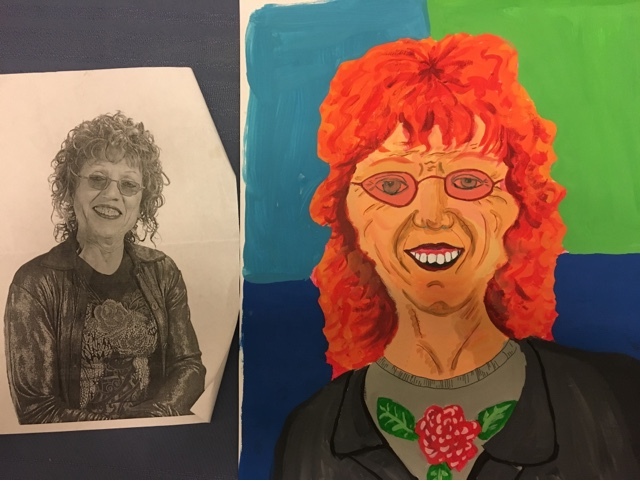 I also finished the portrait of the artist Judy Chicago (of The Dinner Party fame), a project for the Jewish Artists Lab. It is my first acrylic painting and I think there is some resemblance between my painting and the artist herself. I've got a long way to go. What surprised me was how much fun I had painting, especially since I know nothing about acrylics. I can see where quality paints and brushes would be helpful! Finals start Wednesday at my high school, so tomorrow is going to be crazy. I just hope that I am feeling better when I wake up! Every weekend should be 3 days. Seriously! Especially for those of us who work 9-to-10-hour days. I just feel so relaxed and happy. One of the things that is making me happy is the 1 Year of Stitches project. 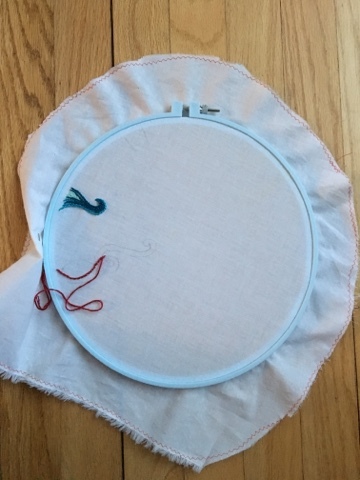 Every day I add at least one stitch to my 10-inch hoop. As you an see, I usually pencil in a line and then go from there. 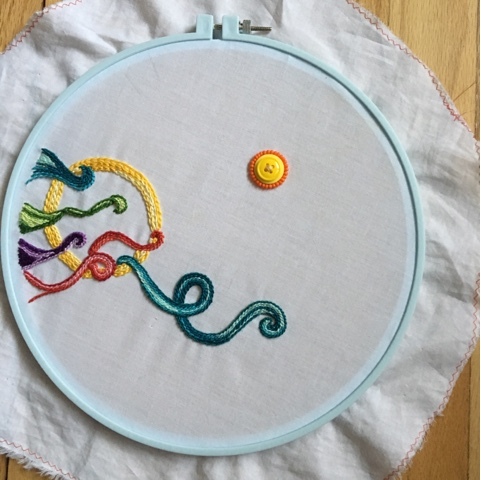 You can see all the amazing projects people are doing on Instagram at #1yearofstitches. I'm using Sublime Floss from the amazing Jenny Hart. I know this is kind of OCD on my part, but I can't bring myself to mingle my Sublime Floss with my DMC. There are many fewer Sublime colors, which I think will help me maintain a sense of wholeness as this evolves. Last night we had dinner and a movie with my parents. Later today I'm going to see Fences with a friend. Life is good! It is a hectic time. To add to that, my hard drive died, which would explain why I haven't been posting or commenting. Thanks to my house husband, that has been taken care of. Still, I'm feeling "off." Life without a computer is weird. 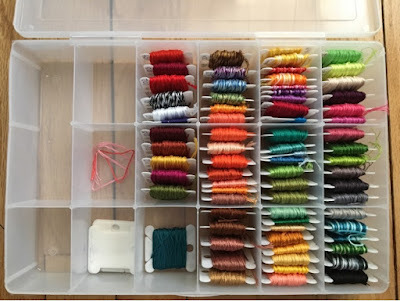 I made the "mistake" of going to a really nice LYS the other day when I needed needles. JoAnn Fabrics has far less temptations, but it is far from my house; the lovely LYS is only about a mile. 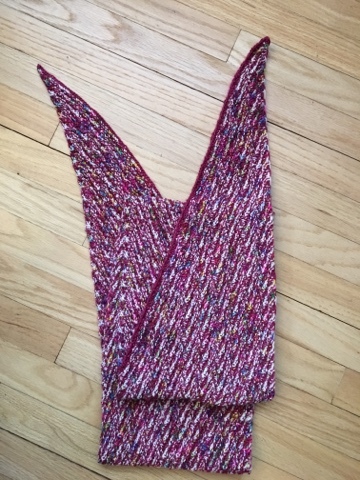 Anyway, they had this pattern, the Trimont Snood, which I'd been admiring in magazine ads. It seems perfect to keep at work, where the temperature is quite variable. 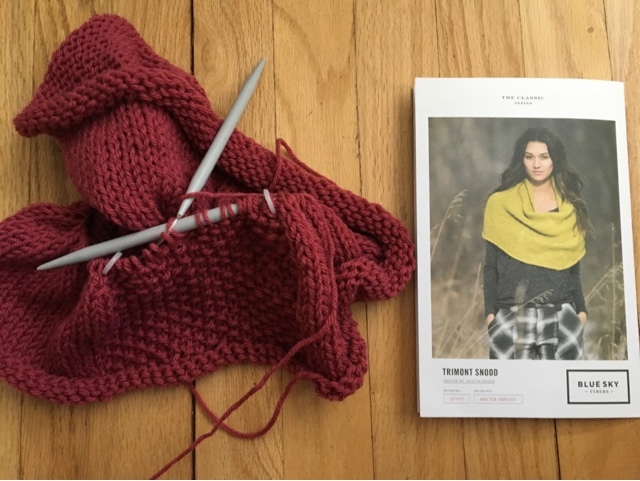 Needless to say, I bought the pattern and a nice basic Rowan worsted in pink. The thing is, I'm getting a little tired of pink, so this may be a gift. If it's really nice, I'd like to knit one for myself in a different color. I started The Girls by Emma Cline. I'm not liking it, but I 'll try to get through a few more pages before I give up on it. I gave up on American Housewife. I liked the first story, but it was downhill from there. The second Robson has been cast off and worn a few times. I have to say that I love this pattern. The fabric it makes is so squishy and feels great against my neck, especially on days like today when the temperature is 1 degree above 0. 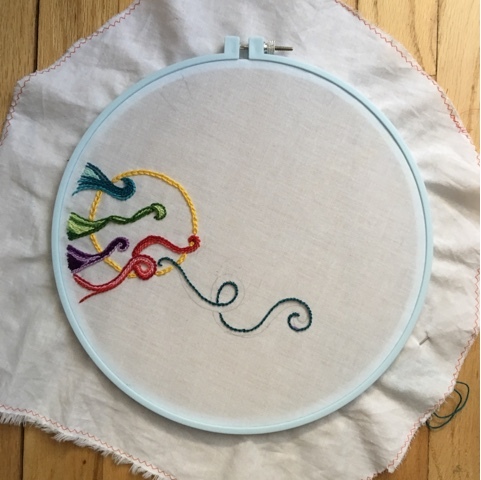 I'm really excited about the 1 Year of Stitches, an embroidery stitch-along coordinated by Sara Barnes of Brown Paper Bag. You just hoop a piece of fabric into the hoop size of your choice and embroider at least one stitch a day. Any type of stitching, thread, or fabric is allowed. You're supposed to take a photo every day, but that's hard to do with such short days here. It's not too late to join. You can find all the information here. I went back to work on Wednesday, and I cannot believe it was only a three-day week. It's Saturday morning and I am exhausted! I really do enjoy my job. High school students are great and my co-workers could not be more supportive. But you say "teen" and I say "crisis." A few of our students are going through terrible times, and I spent more time feeling like a social worker than a teacher. We need more community supports for families! As much as I want to fix everything, I don't have that much power. And the "best" news of all: Over winter break, the state added more required paperwork for special ed teachers. Really? My new saying is: "Why do I have to deal with students? They just get in the way of paperwork!" Still, I don't want to end on a downer. I am lucky to work in a great high school that is known for its quality teaching. Moreover, I still genuinely enjoy hanging out with teen-agers. They are smart and funny and provocative. You have to count your blessings, right? I'm in the midst of two hats. 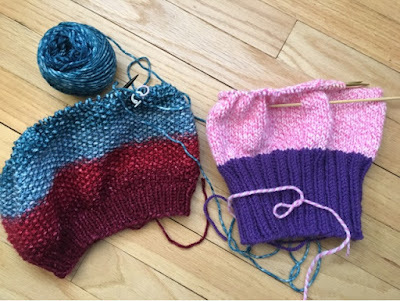 The one of the left is a Toboggan Run by Jaala Spiro, knit in her gorgeous Knit Circus Yarn, Ringmaster worsted in the colorway Birds of a Feather. 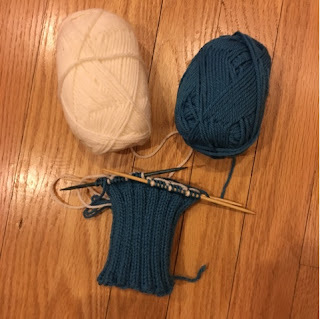 On the right is a Pussyhat I'm making for a friend who is going to the Million Woman March in Washington, D.C., on inauguration weekend. I didn't realize this hat was supposed to be in pink until I was partway through it. Both colors are leftover Encore. 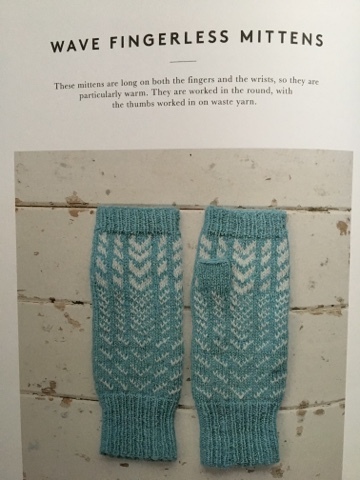 Knitting from the North is a library book that I am in love with. The patterns, mostly accessories, have a peaceful simplicity to them. I'm not sure I'm going to finish My Life in Middlemarch. I can't say exactly why, but it's just not compelling to me. And I haven't started American Housewife, a collection of short stories. It looks like the stories are rather unusual. 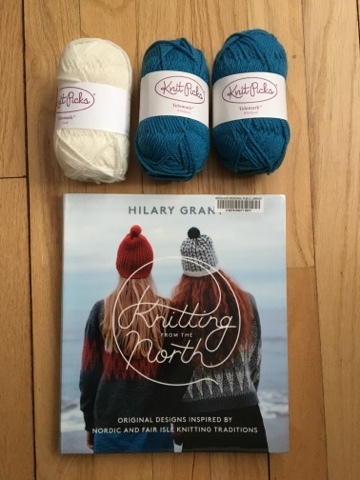 Joining with Ginny to Yarn Along. Let's get to the exciting part first: who won the Think Summer Give-Away? The random number generator (also known as my dear daughter) chose number 7, which would be Gracie Saylor! Congratulations! If you can send your address to deborah.kades@gmail.com, I'll get your package into the mail! 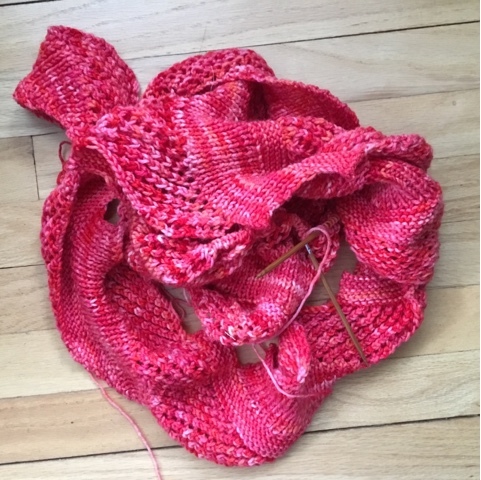 It's a Brickless scarf that I started last year with Miss Babs Yowsa. Isn't the color gorgeous? I don't know why I dropped the ball on this, so to speak. It is a great pattern -- and a useful one for Wisconsin weather! Miss Babbs doesn't call this yarn Yowsa for nothing. In addition to being beautiful, it comes with an enormous yardage: 560 yards of worsted weight. Has anyone make a Brickless out of Yowza? 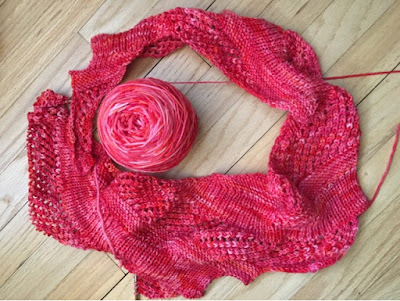 If so, did you use the entire skein? I'm afraid I could end up with a scarf that is too long -- if there is such a thing. It's back to school on Wednesday, so I'm savoring these last few days!